When it comes to the titans of slasher films, Freddy, Jason, and Michael are usually cited as "The Big 3"; for whatever reason, Chucky, the diminutive slasher from the Child's Play films is often overlooked. This was personally the case for myself growing up, as, while I enjoyed the Chucky flicks from time to time, I never considered the series to be as important as those aforementioned series. With the onset of the DVD era, this trend continued, as I was quick to pick up the other series as soon as possible; Child's Play, however, only warranted the occasional rental, mostly due to the shoddy MGM disc that only contained a full-frame presentation of the film. Of course, I ended up breaking down and buying it at some point when it was on sale for a few bucks. Not long after this, however, MGM announced that a Special Edition was on the way that would finally contain a widescreen presentation of the film. Released a few weeks ago, the "Chucky's 20th Birthday Edition" has given me the chance to revisit the under-appreciated series. Before Chucky became an iconic killer doll, he was simply a deranged serial killer named Charles Lee Ray, also known as "The Lakeshore Strangler." However, Ray's reign of terror is seemingly about to come to an end as the film begins, as he's been chased down and shot by Detective Mike Norris. Seeing no other options, Ray ducks into a toy store and uses a voodoo ritual to transfer his soul into a "Good Guy Doll," a popular toy item. The doll in question ends up in the possession of six year old Andy Barclay when his mother, Karen, manages to buy it from a homeless peddler in a back alley. It doesn't take long for Chucky to begin a new reign of terror in his new body, as he kills young Andy's babysitter. Of course, it's Andy himself who is suspected, as no one believes him when he claims Chucky is alive. Coincidentally, Detective Norris himself ends up at the scene, and he, along with Karen soon comes to learn that Andy's story might be true. A lot of people (myself included) question just how scary or serious a killer doll movie can be. This particular sub-genre has been around for a while, with one of the more memorable examples being a couple of episodes of The Twilight Zone ("The Living Doll" and "The Dummy"). In some cases (like those Twilight Zone episodes), killer dolls can be downright creepy, and maybe some people find Chucky to be creepy. I've never found that particular quality in Child's Play, but that doesn't mean the film isn't a lot of fun, nonetheless. While the first entry is certainly more straight-laced compared to the later entries in the series (particularly the last two), I hesitate to call Child's Play an intensely dark horror film. Sure, at its core, the story of a killer doll terrorizing a six year old kid and essentially framing him for murder seems like it should be, but the movie never really feels like it's taking itself seriously. This might be due to the the franchise's star character, Chucky, who is voiced by genre veteran Brad Dourif. While he isn't exactly the wisecracking jokester he would later become, there's still something about the character that makes me laugh more than cower in fear , but that's okay because, honestly, how often are horror fans really scared anymore? Also, as is typically the case with horror franchises, this, the first film in the series, doesn't really feature the killer much until the end of the film. Heck, the film even toys with the idea that Andy truly is the killer, even though the audience already saw Ray transfer his soul into Chucky. Fans don't really see Chucky at his best until about midway through the film, when the character is fully revealed in all of his animatronic glory. Indeed, it's Kevin Yagher's magnificent design and engineering of the Chucky doll that's the star of the film. While the acting by the human principles is good (Chris Sarandon is an asset to any film), Chucky himself holds the entire thing together. If you're going to have the rather ridiculous concept of a killer doll stalking people, it has to be believable, and this is never an issue with Child's Play. When Chucky is fully revealed, he truly seems alive, and he wreaks a lot of havoc. Chucky's carnage extends beyond the simple stalk and slash tendencies of his contemporaries, as the film is full of explosions and car chases and leads up to a nice, suspenseful showdown between Chucky and the three principals that's full of jump scares and false endings. While the later entries in the series would become more typical slasher films, the original doesn't really feel like one. Horror fans shouldn't fret over this, however; there's plenty to like here. 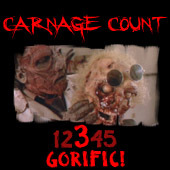 There are a couple of good kills to be found, and the gore is decent enough. As far as atmosphere is concerned, the film doesn't exactly feel like a horror movie at times, and the film has a harsh, cold look (no doubt due to the film's winter setting) that makes the film rather nondescript compared to some of the more lush-looking films of the era (particularly the Nightmare on Elm Street films). If I had to pick a film to compare Child's Play to in terms of overall tone and style, I'd say it's about on par with Maniac Cop (another 1988 release), but it's not quite as gritty or dark as that film. In terms of the series as a whole, the original film truly does feel a bit like a prototype, as I think Chucky really began to come into his own in the first two sequels. Thus, while Child's Play is certainly a very good horror film in its own right, I find it to be more important or introducing the Chucky character more than anything, as he is now very much a horror icon. Sure, he might not be as instantly recognizable as the titans mentioned at the beginning of this review, but he's certainly someone that each horror fan should spend some time with. It's interesting that series creator Don Mancini toyed with the idea of revealing Andy himself to be the killer; thankfully, this route wasn't taken, as it would have deprived the genre of one of its more lively personalities in Chucky. So, just how good is the recently-released special edition, and was it worth the wait? The answer to each question is "excellent" and a resounding "yes," respectively. First of all, the widescreen transfer is simply gorgeous: it's very clean, and the colors pop off the screen. In the audio department, the 5.1 remix is a pleasant surprise. Considering that the film originally sported a stereo track, I wasn't really expecting much from the upgrade, but it really will give your subwoofer a workout during the more action-packed scenes. Plus, the 2.0 stereo track is retained for audio purists. The disc certainly isn't short on supplements, either, as it contains three commentaries (one is done by Brad Dourif in character as Chucky), six featurettes, a photo gallery, and the film's theatrical trailer. While I'm a bit disappointed that MGM opted not to give the film a high-def release at this time, I'm just thankful to have the film in its proper aspect ratio for the first time ever, and all the bonus material make this one an easy purchase for fans of the series. Those horror fans that haven't made a date with Chucky should definitely give it a look, as the film itself is very good, and it marks the beginning of one of the genre's big-time characters. Buy it!